How can you find purpose and meaning from a secular perspective? Mike meets regularly with friends and acquaintances from his neighborhood in a large building. There, he enjoys listening to presentations about big life questions: on the meaning of life, on the nature of morality, on ethical behavior, etc. He participates in study circles that engage with these questions in more depth. Mike sings, dances, and enjoys musical performances there. Together with others, he volunteers to help clean up the streets and build housing for poor people in the neighborhood. Research generally shows that those who believe in God and go to church have an overall more powerful sense of purpose and meaning in life, although some recent studies nuance these conclusions. As research shows, a strong perception of meaning in life leads to significantly higher mental well-being and physical health. But is it the belief in God that creates this stronger sense of life meaning and purpose, or something else going on? Other research indicates that religion satisfies people’s desire to belong. Studies show that people have a higher sense of life meaning and purpose when they are part of a community and have strong social bonds. Likewise, people have a stronger sense of life meaning when they have an opportunity to reflect on this question, by themselves and especiallytogether with others. Religion provides the primary opportunity for community ties and the main venue for discussing life meaning and purpose, at least in the United States. In other societies different institutions offer many of the same benefits as churches do in the US. Well, what about Mike? After all, through his activities, he gains social bonds and community connections, chances for serving others, and places to reflect on big life questions – all the components that make up gaining a sense of meaning and purpose. Mike’s full name is not Michael, but Mikhail, and his experience describes the prototypical experience of Soviet citizens in state-sponsored community activities. For example, the future Soviet leader Mikhail Gorbachev described in his memoirs how much he and other Soviet citizens enjoyed such events: according to him, “everybody was keen to participate” (pg. 6). The Soviet Union is typically perceived as a militaristic and grey society, with a government that oriented all of its efforts to taking over the world. Well, that’s simply not true, as the Soviet authorities put a lot of resources into providing its citizens with opportunities to find meaning and purpose in life, as well as fun and pleasure – although they also certainly wanted to spread communism throughout the world, and put a lot of efforts into this goal as well. To understand how the USSR’s government helped its citizens gain a greater sense of meaning and purpose, I spent over a decade investigating government reports in archives across the Soviet Union, exploring national and local newspapers, read memoirs and diaries, and interviewed over fifty former Soviet citizens. The answer: to a large extent, through government-sponsored community and cultural centers called kluby (clubs). 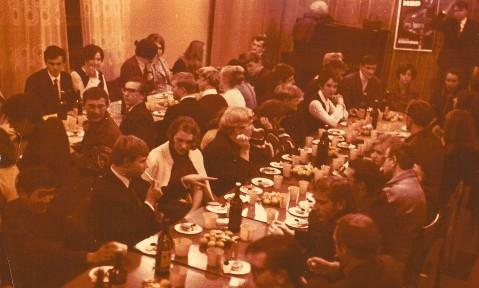 These venues, and other ones such as discos, replaced in many ways the social function provided by churches, offering Soviet citizens social and community connections, chances for serving others, and places to reflect on meaning and purpose in life, in a setting that combined state sponsorship with grassroots engagement. This early 1960s photograph shows a performance from a scene in a Soviet opera, named “Arkhimed,” held at a Soviet club. The photograph comes from the private archive of M. A. Lebedeva. For more on “Arkhimed,” see my published scholarly work (Tsipursky, “Having Fun”). This photograph shows a banquet held after a performance of “Arkhimed.” The photograph also comes from the private archive of M. A. Lebedeva. Present-day societies with a more secular orientation than the United States have similar stories to tell, as illustrated by research on contemporary Denmark and Sweden. Most Danes and Swedes do not worship any god. At the same time these countries score at the very top of the “happiness index,” have very low crime and corruption rates, great educational systems, strong economies, well-supported arts, free health care, egalitarian social policies. They have a wide variety of strong social institutions that provide community connections, opportunities for serving others, and other benefits that religion provides in the United States. So believing in God and going to church is not the only way to attain a strong sense of life purpose and meaning. You can gain it in venues that are secular and provide an opportunity for community ties and a chance to reflect on life purpose and meaning just as religious communities have traditionally offered. Research indicates that those who engage with such deep questions in a setting that does not expect conformity to a specific dogma overall gain a deeper perception of meaning and purpose. Those in college and high school can go to Secular Student Alliance affiliates, while children and teenagers enjoy lively discussions and fun activities at Camp Quest. Venues that include both believers and non-believers also exist, such as United Universalist congregations, including the First UU Church in Columbus, OH, that I attend with Agnes Vishnevkin, my wife and fellow Intentional Insights co-founder. Within UU congregations, specific subgroups exist for those who are secularly-oriented, part of theUU Humanist Association. So if you want to gain a rich sense of life meaning and purpose, without an externally imposed and God-oriented framework, check out local affiliates of these national organizations. You will find a place to reflect on deep life questions from reason-based perspectives, and gain an opportunity to enter communities where you can form strong social bonds and great friendships. Also, check out workshops and videos by Intentional Insights on finding purpose and meaning from an evidence-based perspective, and discuss your thoughts on this topic in a virtual forum on our blog. What is your experience reflecting on life meaning and purpose in a community setting? 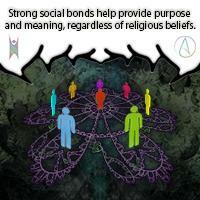 If you are part of a community, do you find that such social ties help reinforce your sense of life meaning and purpose? If not, what steps might you take to gain this benefit and thus increase your mental and physical well-being?